↑ Mackenzie, Colin (1918). 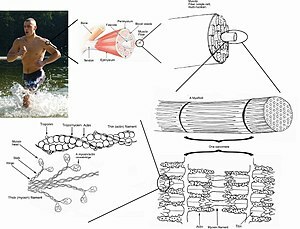 The Action of Muscles: Including Muscle Rest and Muscle Re-education. প্ৰকাশক England: Paul B. Hoeber. পৃষ্ঠা. 1. https://books.google.com/books?id=lww9AAAAYAAJ। আহৰণ কৰা হৈছে: April 18, 2015. ↑ Brainard, Jean; Gray-Wilson, Niamh; Harwood, Jessica; Karasov, Corliss; Kraus, Dors; Willan, Jane (2011). CK-12 Life Science Honors for Middle School. CK-12 Foundation. পৃষ্ঠা. 451. https://books.google.com/books?id=52Y_O15i3C0C। আহৰণ কৰা হৈছে: April 18, 2015. ↑ Alfred Carey Carpenter (2007). "Muscle". Anatomy Words. http://anatomyalmanac.blogspot.com/2008/01/from-archive-muscle-comes-from-latin.html। আহৰণ কৰা হৈছে: October 3, 2012. ↑ Douglas Harper (2012). "Muscle". Online Etymology Dictionary. http://www.etymonline.com/index.php?allowed_in_frame=0&search=muscle&searchmode=none। আহৰণ কৰা হৈছে: October 3, 2012.